Our trailer sewer jetters typically produce pressures ranging from 2500 PSI to 4000 PSI, with high water flow rated to flush away debris. They have high thrust capabilities that are often needed for pulling the jetting hose long distances. All nozzles are custom drilled based on pump’s flow and pressure specifications resulting in optimized equipment and superb cleaning performance. These drain jetters are ideal for removing soap scum residue, grease, hair and food blockages in drains as well as for maintaining and cleaning product conveyance lines. They are also great for root cutting, removal of mineral deposits and corrosion, industrial pipe and tube cleaning. Their ease of use and portability make them an excellent drain cleaner for scheduled drain cleanings as part of a preventive maintenance program. 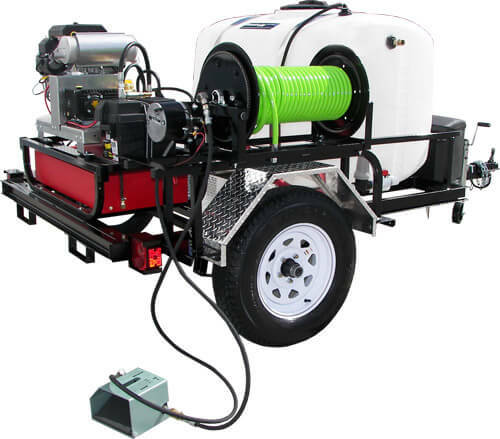 Some of the features of these versatile sewer jetters include electric start engines with low oil protection (shut down) system, adjustable pressure valve, chemical injection for easy cleaning solution application, separate hose reel that provide the option of jetting inside or outside drains with machine operating safely outside, 80 mesh strainer, tool and storage boxes and more. Read more about sewer jetters in our article. Our trailer mounted water drain jetters are special ordered. Please contact us for more information regarding this type of product. Choose Jetter Hose Options Flow Rates of 5.5-8 GPM require 3/8” jetter hose, 10-12 GPM require ½” jetter hose. 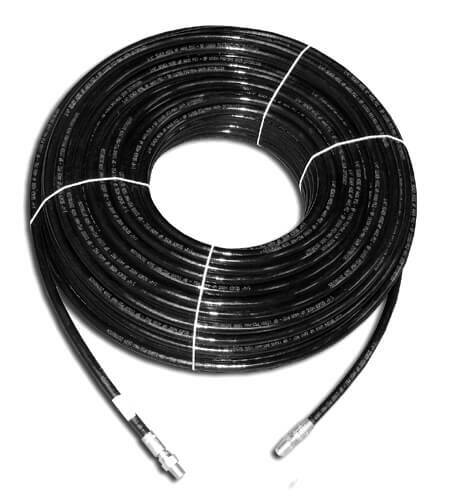 Sewer Jetter Hose - ideal for cleaning clogged lines and pipes. What size hose do I need for cleaning sewer pipes? Operators of sewer and tube cleaning equipment need both hands free to feed or retract the hose in the sewer line. Excellent for pipe cleaning, sewer and drain cleaning.